The world's first hybrid cruise ship, the Hurtigruten MS Roald Amundsen. The Roald Amundsen's features a new and sustainable hybrid technology, which means it is powered by both batteries and fuel. Using these two sources of power reduces fuel consumption and carbon dioxide emissions by 20 percent. Hurtigruten has been operating for over 120 years and the Arctic was one of the first cruise line's first destinations. The company appreciates the fragility of the polar regions but also recognizes that all who visit come away with a desire to preserve the environment for generations to come. Building hybrid ships is an excellent demonstration of Hurtigruten's environmental dedication. Anyone who has ridden in an electric car, golf cart or boat with electric motor knows just how quiet these vehicles can be. Although the ships can only sail with electric power for short periods of time, can you imagine quietly cruising for 15-30 minutes through an icy harbor of the Arctic or Antarctic? It would be amazing! 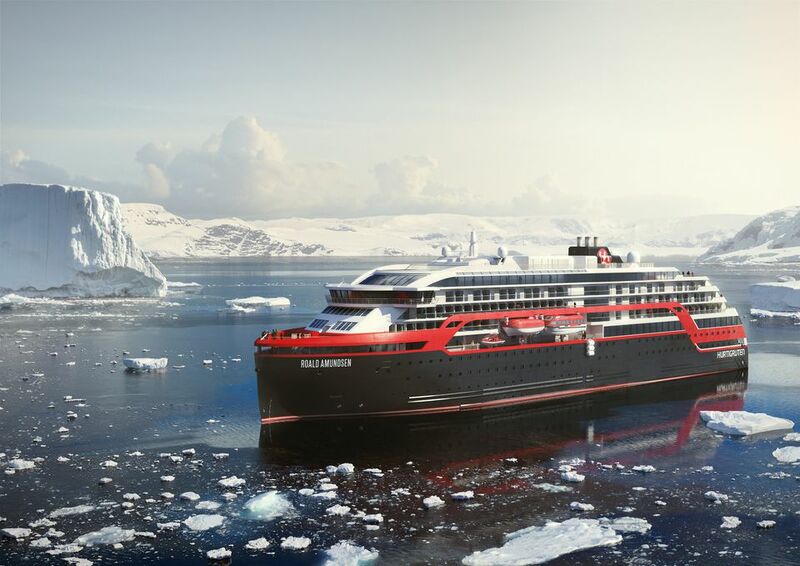 In 2019, Hurtigruten plans to launch a sister ship to the MS Roald Amundsen, the MS Fridtjof Nansen. This ship is very similar to the Roald Amundsen but can sail longer under total electric power. The investment in the two ships represents the company's largest singular newbuild expenditures. Hurtigruten has an option for two more hybrid ships. The Hurtigruten MS Roald Amundsen has a sleek, modern Norwegian/Scandinavian design, with innovative use of granite, oak, birch, wool, and other natural materials. Since Hurtigruten's focus is on exploring rather than cruising, the ship has several large observation lounges. Since the ship sails in polar regions, having indoor viewing areas is important for guest satisfaction. The MS Roald Amundsen has several different categories of cabins and suites. All of the cabins are on the outside of the ship. Six of every ten cabins have balconies, and two out of ten are suites. Some of the cabins have a kettle and tea/coffee provided. All the cabins have televisions that broadcast views from the bridge so guests can know when it's time to go outside to take photos. The expedition ship has a large outdoor pool deck as seen in the photo above. The pool deck also has hot tubs and a pool bar. Although the ship sails in polar regions, most guests take along appropriate clothing, so the outdoor decks are often full of passengers gazing at the amazing scenery. The MS Roald Amundsen has three dining venues, with menus focused on local dishes and destinations. Who Are Roald Amundsen and Fridtjof Nansen? Some North American travelers may not know what Roald Amundsen and Fridtjof Nansen did to get cruise ships named after them. Both are Norwegian explorers. On December 14, 1911, Roald Amundsen was the first person in the world to plant a flag at the South Pole. This is a major event in Norway, and Hurtigruten celebrates that day on its Antarctic cruises. Cruise ships can't make it to the South Pole since Antarctica is a continent, and it took Amundsen and his men almost two months by dog sled to reach the Pole from the Ross Sea. It's very difficult to understand that they stayed in tents much like the one shown in the photo above. Amundsen was also the first person on earth to visit both the North and South Poles. Fridtjof Nansen's claim to fame is that he used cross-country skis to cross Greenland in 1888. He was the first to complete this trek. In addition to being an explorer, Nansen was also a scientist, diplomat, humanitarian and Nobel Peace Prize laureate. Both these men are certainly deserving, aren't they? The ship sails a series of 16 to 20-day cruises to the Antarctic peninsula, Chilean fjords, Falkland Islands, and Patagonia starting in late October 2018 and continuing to March 2019. Some of these cruises include a stopover at Cape Horn, which is often called the "End of the World". The Roald Amundsen joins two other Hurtigruten ships, the MS Fram and MS Midnatsol on Antarctic itineraries. Although the MS Roald Amundsen didn't begin sailing until October of 2018, Hurtigruten announced in advanced that some of her Antarctic and South American itineraries, and bookings were open for these cruises. After completing her first season in Antarctica, the ship sails up the western coast of South America. After sailing back to Norway on a series of American and European cruises, the Roald Amundsen itineraries include Arctic destinations like Greenland, Iceland, Spitsbergen, and northern Canada, along with the traditional Norwegian coastal voyages. When the ship is not in Antarctica, she sails Arctic itineraries and possibly will cover all or parts of the Norwegian coastal voyage route between Bergen and Kirkenes. This coastal route includes many fascinating stopovers, and it's a real treat to cross the Arctic Circle. Photographers will especially enjoy the opportunity to take spectacular photos, since this route is often called, the "world's most beautiful".